I just wanted to stop in to my blog to give all my readers a heads up that idiocracy is recruiting. Check out the link to our homepage to find our recruitment needs, raid times, and general philosophy. We are looking for a few good players, 25-man ICC heroic-ready, of the following classes: holy paladin, unholy DK, warlock, disc/holy priest, combat rogue, and fury warrior. I apologize that I have not been posting lately. This has not been due to a lack of things to talk about regarding WoW and resto druids but a result of being insanely busy with school, applications, teaching/tutoring, and classes. I am still raiding four nights a week (more including 10-mans on off-nights), and my guild is still currently working on 25-man Heroic Lich King, and 25-man Heroic Halion. Both of the above guides are spot-on and have some fantastic information in them. Additionally, don’t forget to check out talent, spell, etc. updates on mmo-champion.com. As always, I welcome comments either via the website or email (treehaelz@gmail.com). Monday night, my 10 man group for ICC formed again to test our mettle against heroic Lich King. We’ve been working on the fight for months, battling attendance and group composition issues, but the last couple of weeks we’ve been able to get some decent attempts in. Things were finally starting to click in all our heads last night, ie. tanks weren’t dying from beserked/frenzied adds, people were avoiding shadow traps properly, defile positioning was improving, and the valkyr dps was increasing. We obviously weren’t using the ideal group composition, meaning we had more melee and healers than most guilds have used in their first kill. For healers we used a holy paladin, a discipline priest, and a resto druid. For tanks, we had a feral druid and a warrior, and our dps consisted of an enhancement shaman, a ret paladin, a rogue, a hunter, and a mage (whom I tossed multiple innervates). Our strategy for healing was pretty simple honestly. The discipline priest was in charge of bubbling for infest and dispeling the necrotic plague. The holy paladin beaconed the Lich King tank and healed the add tank while I maintained HoTs on both and directly healed mostly the Lich King tank (nourish, swiftmend, NS + HT macro). For the later phases, the holy paladin maintained his tank-healing while I tended to focus more on the raid, especially while in Frostmourne (rejuv and wild growth ftw!). 1. Have everyone enable chat bubbles and DXE chat bubble announces for shadow traps and necrotic plague. 2. Keep a focus on the Lich King and enable focus’s target – this allows you to see immediately who he targets for defiles, when he’s casting infest, etc. 3. Get Vuhdo, seriously. Automatically tracks infest, necrotic plague, raid icons, and you can make it track bubbles (information overload on mine personally). 4. Spread out for defiles especially when the valkyr are not immediately incoming. As a healer you don’t need to be anywhere near the valkyr unless they’re coming down to pick someone up. And standing in the kite path of the valkyr is a no-no if you get defile. 5. As a resto druid, let the other healers regen mana while in frostmourne. You can cover the entire raid easily as long as no one is taking spirits to the face. 6. If you can spare the mana, send your innervate to a dpser. The damage requirements for this fight, especially with three healers is high enough that it may make or break the kill for your group. 7. Pop your barkskin if vile spirits come after you, it will help you survive one or two. 8. If there is no feral or boomkin, make sure you’re putting up faerie fire on the boss. Hope this helps and as always, feel free to send me an email (treehaelz@gmail.com) or come talk to me over on Alexstrasza! So, my guild has sort of been slow to progress as of lately (more like a dead halt) due to hmm, a lot of factors. But recently, the number one guild Alexstrasza and our main competition imploded, so we’ve received a rather large influx of new, very talented players. Thanks to them, we’ve had enough raiders and proper group compositions to actually work on progression bosses like 10 and 25 man H LK and 10 and 25 man H Halion. Friday nights have always been difficult attendance-wise for us, though it’s one of our main off-nights for practicing in 10 mans. Point in fact, we started probably an hour late and only had one group running at a time since we were still short raiders. But I tell you what, once we got going, we were on fire. We started with 10 man heroic ruby sanctum. 10 man heroic Halion 2-shot! Bam! Now, granted we’d all spent a ton of time learning the fight and wiping on it. People dying to the “cutters” (those nasty lazer beams inside the twilight portal), soul or fire consumption, fire from the meteors outside the portal, improper positioning of the voids on the ground, and just plain lack of heals sometimes were things that were wiping us. Over the past week or two we have tried some seriously strange healer compositions. I’ve solo-healed inside the portal, I’ve solo-healed outside the portal (this usually didn’t end well, though if I wasn’t running with fire consumption I could keep the tank up). We also tried 4-healing it because we were having horrible survivability issues (despite what you might think, it didn’t work). Good old-fashioned three-healing it was the way to go for us. We used a resto druid and disc or holy priest inside the portal and a holy paladin outside. I thought it was a fantastic start to our night. We then headed over to 10 man heroic ICC to reactivate an older raid lockout that had only the Frost wing and the Lich King left alive. This was for time-saving purposes, and to allow us quick access to what we really wanted to work on, that is the Lich King. We finally had a decent group composition, which for those of you with any experience at all know is crucial. It definitely wasn’t perfect though since we had three melee dps and two ranged. But for us this can be a pro since our melee dps are very very good and are usually top dps if the fight mechanics allow. Plus, I’m lost without Dolph and his replenishment, aura, and Shadowmourne, not to mention Zakiyya‘s totems and heroism. 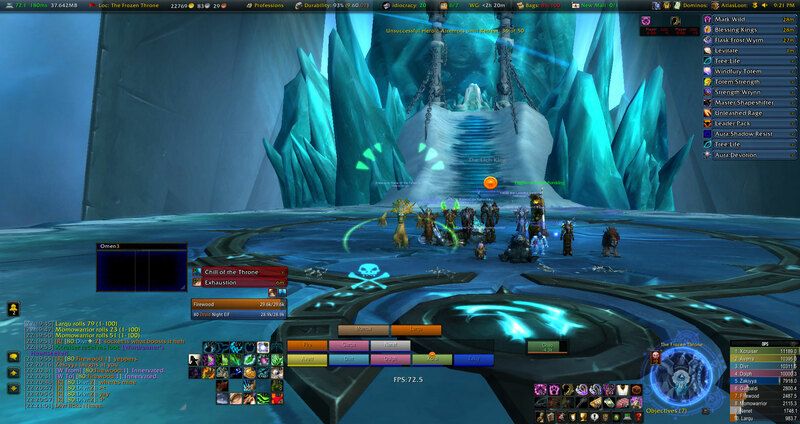 We ended the night well…..10 man Heroic Lich King to 18%!! Hopefully when we get back together Sunday or Monday we can squeeze out our kill before they increase the ICC buff up to 30%. I’ll keep you updated. 1. <idiocracy> has progressed to 11/12 25-man and 10-man ICC heroics. We’re currently working on both 10 and 25 man heroic Lich King. 2. Fîrewood now has the Raven Lord mount!!! 3. I’ve been secretly working on my PvP gear and my partner Unolith and I have recently just gotten over a 1600 rating. This doesn’t sound like much, but I assure you, it is monumental for me. Our goal as of the moment is to get over 1800. 4. I recently updated my user interface. I’ve been using a few new addons, and have gotten rid of some others. You should be able to take a good look at it on my UI page. 5. I too have been working on some of those pesky achievements. Most recently, I’ve been doing the Netherwing dailies, attempting to obtain a Netherwing drake. 6. Woot! Glory of the Icecrown Raider (10-player) completed! 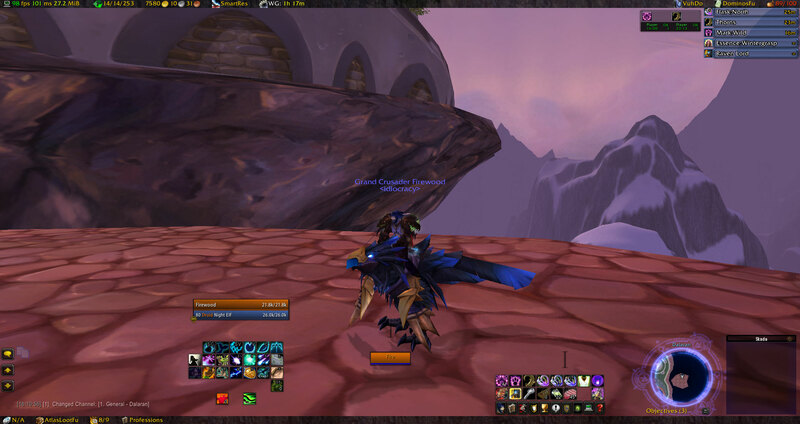 New mount, Bloodbathed Frostbrood Vanquisher obtained. 7. I’m planning on getting back to writing more resto druid raiding posts here. However, I’m torn as to which boss fights people most want to hear about. I’ve done all the heroic versions of everything in ICC, both 10 and 25 man. So, here’s where all you guys get to help me out. This post will be an all-inclusive break down of the fight mechanics and how to heal most efficiently and effectively as a resto druid. Send me your responses by commenting on the post, emailing me at treehaelz@gmail.com or sending a twitter to Treehaelz. Lately, I’ve been getting a couple comments to add a few items to the list I created previously containing all the possible icecrown citadel loot for resto druids. So, I did. Hopefully I managed to update all the different possible pieces that a resto druid might find useful or beneficial. Again, please let me know by comment or email if I missed a piece you think should be included. Additionally, these pieces aren’t in any specific order, mostly I listed them by ilevel. 😀 Enjoy! Wow…sorry, I’ve been really bad lately. The holidays threw a complete wrench into my schedule. Plus, I started a new medical clerkship rotation on Monday, which is always stressful. I’m doing inpatient Pediatrics on the Infectious Disease team this month, should be fun and interesting. I’ve still been raiding, just haven’t had much time to spend blogging. In addition, after looking things over….the first wing of ICC including Lord Marrowgar, Lady Deathwhisper, Gunship, and Saurfang are such a cake-walk that I feel like a guide to them really isn’t necessary. The mechanics of the fights are so simplistic I think my 3 year old patient could figure them out. However, the next wing of ICC has opened and I figured that it might be a good idea to get some information about those fights up (*cough* I need to be prepared for raid *cough*). Gaseous Blight: The Gaseous Plague inflicts 4388 to 4612 Shadow damage to all nearby players. As soon as Festergut is engaged, this gaseous blight is released across the entire room. Inhale Blight: Festergut inhales the Gaseous Blight in the room, increasing damage dealt by 30%. Stacks up to 3 times. This reduces the density of the gaseous blight in 1/3rd of the area in the room and thereby reducing the raid-wide damage. Once Festergut does this 3 times, clearing the entire room of the gaseous blight, he will use his next ability – Pungent Blight. Pungent Blight: Violently releases the Gaseous Blight, dealing 48750 to 51250 Shadow damage to all enemy players, releasing the deadly Blight back into the room. Gas Spore: This is a targeted ability -if targeted, you will explode and infect all nearby friendly players, dealing 1950 to 2050 Shadow damage and increasing their resistance to the Blight. Nearby friendly players gain the Inoculated buff. Gaining 3 stacks of the inoculated buff is key to surviving Festergut’s Pungent Blight. 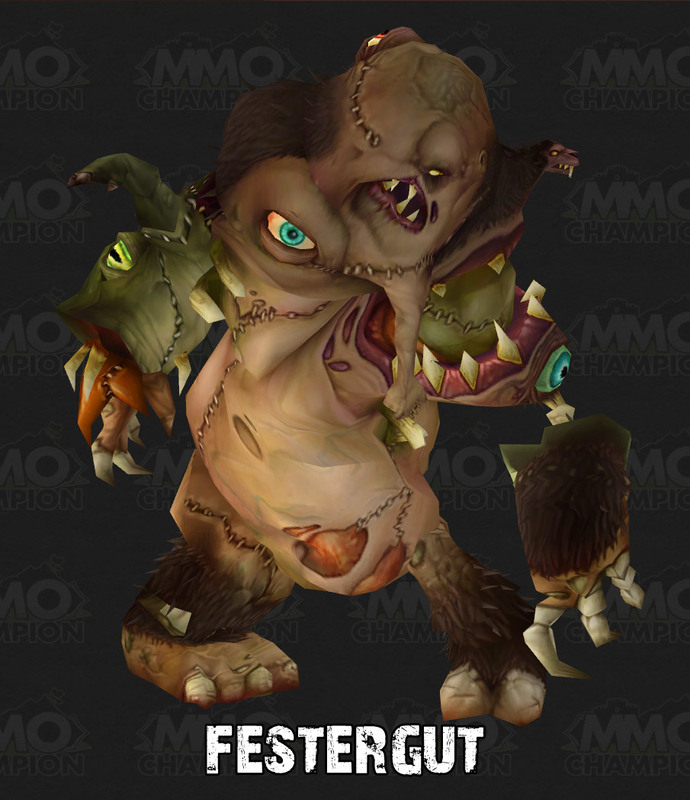 In 25 man five gas spores are thrown out in the raid each time Festergut uses this ability. Inoculated: You have become resistant to the blight, decreasing Shadow damage taken by 25% for 2 min. Stacks up to 3 times. Vile Gas: Inflicts a Vile plague in targeted area, inflicting 4875 to 5125 damage every 2.0 sec for 6 sec. The plague causes the infected targets to vomit uncontrollably inflicting 3900 to 4100 damage to nearby allies. This ability prevents players from stacking up and forces us to spread out. Vile plague has an 8 yard range. Our guild downed this boss relatively easily last night once the server lag finally eased up. Since I’ve had a little experience now healing this fight, I’d like to pass on some information to help other resto druids maximize their healing efficiency during this fight. 1. This fight progresses in cycles. What I mean by this is in the beginning there is a significant amount of raid damage, but as Festergut uses his inhale blight ability, he decreases the amount of raid-wide damage and increases the amount of damage the main tank is taking. My strategy for the first portion of this cycle was to blanket the ranged and healers with rejuvs. Secondly, I attempted to use Wild Growth every cooldown on the melee. I found that this first portion of the fight felt very similar to healing the Twin Valkyr. In addition, always keep up a rejuv, regrowth, and lifebloom on the main tank. As the fight progresses, Festergut uses his inhale blight ability and the raid damage continues to decrease. A rejuv or two on ranged/healers is useful if they’re taking more damage, but as the cycle continues you can shift your focus more and more to the tank. Maintain your full set of HoTs and be ready to use a Swiftmend just in case. I saw a few 30k hits on our tanks last night, so there is some significant tank damage once Festergut reaches 3 stacks. 2. Another thing to be aware of is the vile gas debuff, I found a rejuv plus a lifebloom was plenty sufficient to prevent these players from dying. 3. Thirdly, when gas spores spawn and you group up to get the Inoculated buff, be aware that when the gas spore explodes on its target, it deals damage. I tended to use a Wild Growth first on the grouped up players and then if necessary rejuvs to maintain their health. 4. Finally, Pungent Blight does significant raid-wide damage even with 3 stacks of the Inoculated buff. With any less than 3 stacks, you will most likely die. What this means is use your survival cooldowns…Barkskin, Healthstones, etc. In addition, use Wild Growth and Rejuvs to top the raid up afterwards because very shortly the room will again be filled with the Gaseous Blight and the raid will take significantly more raid-wide damage. I also recommend pre-HoTing prior to the Pungent Blight, this will top the raid off quicker and make the other healer’s jobs easier. Hope this helps you all, best of luck killing Festergut! I plan to have a healing guide up for Rotface and then Professor Putricide within the next few days. Happy raiding! My apologies for the slow response time on some of my recent comments. I unfortunately lost internet connection for 2 days. /cry I missed raid twice. Fortunately, I managed to get my internet connection back tonight along with buying a laptop so I can be a little bit more mobile over the holiday break. Second thing I’d like to mention is be prepared for a big post this weekend. I plan to finish working on some 25-man ICC/10-man ICC resto druid raiding guides and they will hopefully be ready by Saturday or Sunday.